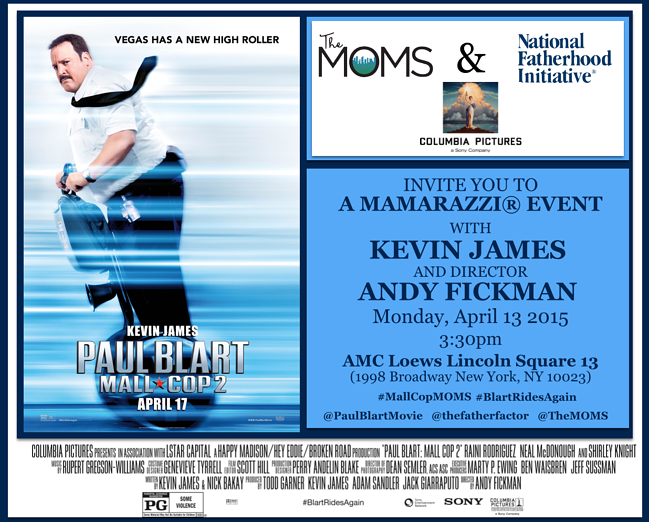 National Fatherhood Initiative and The Moms partner for a special New York City screening of Columbia Pictures' upcoming film Paul Blart: Mall Cop 2 with Paul Blart himself, Kevin James, on Monday, April 13th. The film releases in theaters nationwide Friday, April 17th, but don't miss out on the chance to see the new movie before anyone. After six years of keeping our malls safe, Paul Blart has earned a well-deserved vacation, or has he? Sony's Paul Blart: Mall Cop 2 arrives in theaters Friday, April 17th. Vegas may have a new high roller, but not before that high roller visits NYC! After the screening, please stay for a Q&A with Kevin James and the film's director, Andy Fickman (also an NFI Fatherhood Award recipient for Parental Guidance, the 2012 Fatherhood Movie of the Year), followed by a special presentation of the NFI Fatherhood Award to Kevin James. After six years of keeping our malls safe, Paul Blart has earned a well-deserved vacation, or has he? In this sequel, Paul Blart heads to Vegas for the annual Security Guard Expo with his teenage daughter Maya (Raini Rodriguez) before she leaves for college. While at the convention, he inadvertently discovers a heist – and it’s up to Blart to apprehend the criminals. Safety never takes a holiday and when duty calls, Blart answers. This movie was as entertaining as I remember the first one. But with a deep father-daughter story. A fun family film with a father-daughter story that will have you leaving the theater thinking about connecting with your child. Here's your invitation to the special event...RSVP if you can make it to NYC! RSVP here for the NYC screening > Click here to RSVP. More information on the film > Click here to visit NFI's Official Paul Blart Page.